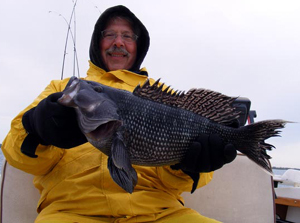 Point Judith Fishing Charters for Scup, Sea Bass, Stripers. Targeting Stripers, Bluefish, Scup, Flounder, Sea Bass, Tuna. 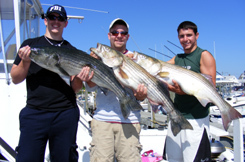 The Galilee channel is a prime location for reaching the productive fishing grounds of southern Rhode Island. Jim’s Dock is the closest you can get to the channel and that is where we sail from. Within easy cruising distance of Block Island, the south shore, and the Narragansett shoreline as well as Newport and lower Narragansett Bay. We have been chartering from here for years and know how to find the fish and put them in the boat for our customers. We want to catch for for our customers, not just take them for a Rhode Island boat ride. Our most popular trip is for Stripers and Blues, but it is best to talk to the captain about when you want to fish as he may have local knowledge that may change your target species. 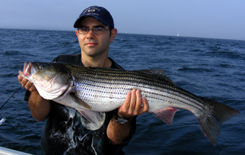 We fish for Striped Bass, Bluefish, Flounder, Scup, Sea Bass, Tuna, and Tautog. Our fishing season starts May 31st and continues through to October 31st. We are definitely in business, although the 2009 fishing season will soon be coming to a close. We fish the South shore of Rhode Island as far as Westerly and Watch Hill, South to Block Island, and parts of Narragansett Bay. Most of the time we are within 1-2 miles of land when we’re fishing. Our Rhode Island fishing boat is a 25' center console pilot house vessel with plenty of fishing room front and back to bottom fish for scup and sea bass or for casting and catching stripers, blues or tuna. This vessel also has an extremely stable ride and a bathroom. We can take a maximum of 6 passengers. Windbreaker / foul weather gear/ Hat appropriate to the weather. Food & Drink (no hard liquor). Large Zip Lock Bags for your fish or an extra cooler. Before your trip get a full night's rest. If you tend to get sick, take no-doze Dramamine or Bonnine at least an hour before you get on the boat. Don't drink alcohol prior to the trip.